The definition of cloud computing is somewhat formal. Computing is described as “a model for enabling convenient on-demand network access to a shared pool of configurable computing resources”. For business managers and owners evaluating whether to eliminate or reduce their equipment and computing resources to virtual servers out of control, that definition lacks a comforting tone. Most companies own their software and hardware. With cloud computing companies subscribe to their computing resources or digital assets. 40% of small and medium sized businesses saw an increase in productivity and efficiency after adopting new cloud technologies. The business benefits that drive these increases include disaster recovery, automatic software updates without maintenance fees, no capital-expenditure, increased collaboration, work mobility for employees and data, document control, and security. “Safely Enter the Cloud: Cloud Computing Basics” is a primer written to take the reader through cloud computing, it’s various instances, how it can be applied to solve business problems, and how it can be used to create greater opportunities leading to significant competitive advantage. Transforming a business to the cloud leads to competitive advantage through optimization of IT staff, shorter launch cycles for new applications, better functionality to support new sales and customer support, and more complete Business Process Integration for improved automation of services. 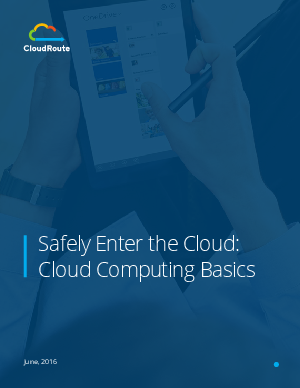 Read “Safely Enter the Cloud: Cloud Computing Basics” and gain much needed knowledge about this major new technology direction.